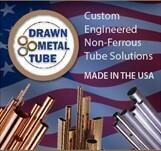 With over 2,500 products, Lewis Brass & Copper makes it easy to find your particular product. Below is a list of our stocked products we supply. Our immense in-stock inventory helps us fulfilll your orders quickly. Not seeing exactly what you are looking for? Drop us a note or call, and we will custom create your order.